Footage shared via the influential Beijing News has been viewed over 12 million times. However, Beijing News says that the boy's father disputes the video's authenticity. "He [the father] says that his son cannot yet urinate that high, he doesn't believe it, and his son won't admit it, says he didn't do it," a reporter tells the paper. Over 20,000 Sina Weibo users have commented on the video. Many comments support official media sentiment that "bear children", as unruly kids are known in the country, should be given better discipline at home. 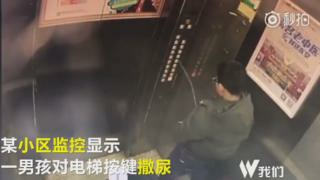 "His family education is shameful," says one user, and another adds: "His guardian should pay compensation for the elevator breaking," receiving over 11,000 likes. But some encourage users to see the funny side. "Don't take this too seriously, he's just a kid," says one user. Others say that it is "admirable" that he is able to urinate "so high".